I have had numerous questions recently about riding “aero”. Questions have ranged from: installation and selection of clip on aero bars, what to expect when riding aero bars, wind conditions, flexibility and the benefits of aero bikes vs. road bikes vs. TT/Tri Bikes. So what does Riding Aero mean? Riding Aero is used to describe a rider’s position on the bike. The aero position usually refers to the lowest possible position a rider can get into in an effort to become more aerodynamic. These aero positions are often desired on road, track and TT/Tri bikes. Being aero on a bike is more than just a particular set of hand positions. It’s also about reducing frontal mass. Grabbing the drops on your road bike and lowering your chest over the tops while descending is aero but is it as aero as a position on TT bike? A TT/Tri bike that has been fitted to a particular athlete will be set up to reduce as much frontal mass as possible. By bringing aero bars closer and closer to the stem the more an athlete’s shoulders will round off reducing the frontal mass being presented to wind and air. By lowering the stack height of the stem the lower a rider’s upper body will also be. The same athlete riding a road bike in a downhill tuck on a descent is presenting squared off shoulders so the position is not as optimal as the TT/Tri bike. I am not suggesting that you bomb down your favorite descent on a TT/Tri bike! Instead, I wanted to give an example of how the two bikes differ when it comes to optimizing an aero position. While a well-designed TT/Tri bike will have many ways to fit the rider the focus is on aerodynamics and sometimes at the expense of comfort and stability. Being in the drops on a road bike has an added benefit that is missing from TT/Tri bikes. When getting low on a road bike you effectively improve the bikes handling because you have lowered the center of gravity. So can a roadie take advantage of TT tech? 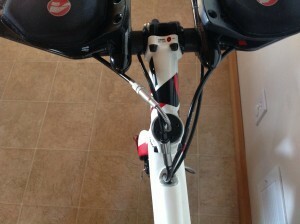 Road bike owners can use clip on aero bars to help present a smaller frontal area. When riding any hand based position on drop bars it will leave our chest open and shoulders square. The more we can close off the chest the less our upper body will catch the wind. We refer to this as tea cupping. So having clip on aero bars can eliminate or reduce the tea cup effect and potentially round off the shoulders some but not as much as on a TT/Tri bike. The aero bars are only one aspect of what makes a TT bike more aerodynamic than a road bike. The rest is about tube shapes and minimizing dirty air. Dirty air is another way of saying turbulence. Components, clothing, and wheels that are not designed or optimized for aerodynamic performance often cause dirty air, which creates additional drag. 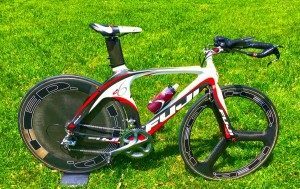 In recent years there has been a trend to apply what has been learned from making TT/Tri bikes faster and applying the technology and designs to road bikes. These new aero road bikes will have tube shapes that use aero profiles, use internal cable routing and hide components like brakes from the wind as much as possible. All the while giving the rider the position on the bike they need to navigate their way through the peloton and descend mountains with confidence. What should riders new to aero bars expect? New riders should expect it will take time for your body to adapt to the new position, the position is not the most stable and lastly, new riders need to be patient with the new position. Hoping on to a new TT/Tri bike or road bike with clip on aero bars can be exciting as you are expecting to go fast and quickly discover how sketchy the position feels. My first suggestion is to ride the new bike or position indoors on a trainer for a few weeks so that your body can adapt to this new position and so that it is one less thing that you are trying to process when you go outside to ride for the first time. The complaint I most often hear from new TT/Tri bike owners is of sore shoulders and a stiff neck. Some of this is just going to take the time to get used to. Some of it could be related to your fit in the aero bars and the biggest culprit is a poor aero bar fit. You want to make sure that your upper arm is perpendicular to the aero bar pads. If not you are wasting energy to keep the body propped up. Once you do get outside to ride on your aero bars remember that lots of things are going to feel amplified. Slight crosswinds will have a tendency to push you off your line. Pavement that is in less than perfect conditions will rattle you and make you feel sketchier than if you were on your road bike. Turbulence from passing riders and vehicles can also make for a traumatic experience. The big takeaway is to try and relax, don’t overgrip the end of the aero bars and remember that all navigation needs to be subtle! We don’t steer road bikes and bikes with aero bars are no exception. What feels like a twitch to you on the road bike may feel like an oversteering correction on aero bars. So less is more when riding on aero bars. Also for the first timers out there, I suggest finding a large parking lot to practice riding before hitting the open roads. Unlike Road bikes, TT/Tri bikes are designed to go fast in a straight line and not for cornering speed. You have been warned! 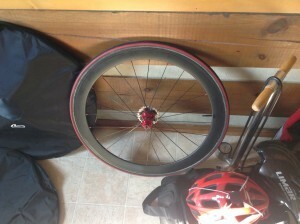 Do not try to put your TT/Tri bike into a corner like you would at a Criterium. What can I do to minimize the impact of unfavorable wind conditions? The best wind for anyone is, of course, a tail wind but we are rarely blessed with such a day. We are often facing crosswinds headwinds or some combination. When riding into a headwind I find my concentration is more on my cadence and staying loose and this works very well until gusting crosswinds hit me. These short little crosswinds have a tendency to stall. So what happens as you lean into the cross wind it dies off and you have to try and quickly compensate. If you are really unlucky it happens repeatedly and it can put you into a scary speed wobble. What I have found as the best cure for these smaller pushes from cross winds is to lay down more power. By gearing to a harder gear combination and applying more pedal force I find it helps me to stabilize and get through these tough areas of a course faster. There will be winds however that are too strong for this tactic and I find that sometimes I just have to get up on the base bar and ride it out. If I can’t ride in the aero bars due to strong winds then I have made a mistake and should have brought my road bike! There are other factors at play too like wheel selection. I often hear from those that have never ridden a disc wheel that I am going to have a tough time with wind because of that sail on the back of my bike. I stopped trying to explain that its not the rear wheel you need to worry about it’s the front wheel! The vast majority of the rider’s weight is over the rear wheel. While I am not a heavyweight I can say with confidence I do not have the physique of a world-class climber. So my 160-170 lbs. of body weight keeps my rear disc wheel firmly planted. The problem with front aero wheels is they are lighter and employee a deep section rim which makes them more prone to stall and pushing forces from crosswinds. As I mentioned earlier in the article one of the most common complaints of riding aero is that of stiffness and soreness in the upper body. If soreness and stiffness in the neck and shoulders progress you may need to spend some time in the gym building some upper body strength or spend a bit more time stretching. You may find that your lower back, glutes, and calves are a bit sorer when you start riding in an aero position. Well, I hope the above helps you to make some informed decisions when going aero or at the very least helps you to prepare for making the transition to aero riding.